FA: Curt Haire and Wes Hall, 7/75. The first ascent party named this formation the North Spur, when actually it is the east spur. Despite the misnomer, this is a summit worth climbing. Pitch 1 begins in a right-facing corner that quickly turns into a left-facing corner and then into a chimney capped by a large chock stone. Just above and right of the chock stone a large juniper tree is visible from the ground. This tree marks the top of Pitch 1. The lower half of the route follows this crack/chimney system for three pitches. After Pitch 3, Chimney Sweep heads left up broken terrain to gain the broad vegetated ledge that separates the lower half from the upper half of the formation. This vegetated ledge marks the halfway point of the route. 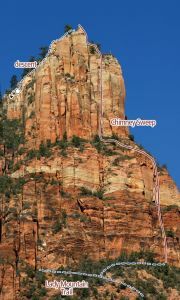 The upper portion of Chimney Sweep follows a weakness just right of center of the east face pillars and corners. The original line traverses left out of this system somewhere near the top of Pitch 5. However, it’s possible to continue climbing straight up the left-facing corner for two more pitches (see photo). The rock is clean and the climbing is fun to the top of the formation. The last couple of pitches are in the 5.9/10 range. The original finish is reportedly 5.7. Descent: scramble down south from the summit towards Lady Mountain and do one rappel into the notch between the North Spur and Lady Mountain. Follow the gully down to the east until it starts to become too steep to proceed. From here traverse right 50 feet, staying heads up for the arrows on the wall that mark the way down the Lady Mountain Trail. Follow this trail back to the base of the North Spur and traverse back to your pack. Which SuperTopo guidebooks include a topo for North Spur Chimney Sweep?